5-7-9 North 4th Street was operating a bar by 1936, when it was known as the Big Horn Cafe. Antonio Panetta, of 1200 Jackson Street, Camden, was the proprietor. It was named for a pair of longhorn steer horns which hung in the bar. 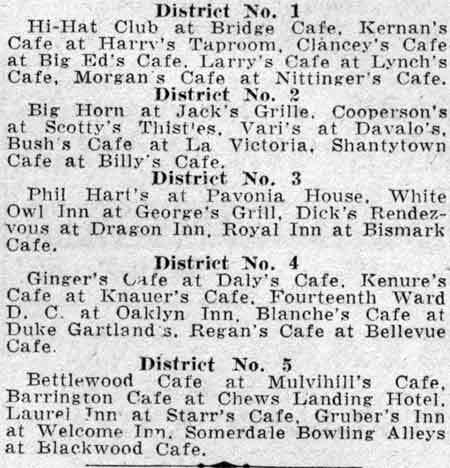 When Prohibition was repealed in 1933, The Big Horn Cafe was the first bar to be licensed. Antonio Panetta was born in Italy around 1887. He had come to America in 1900. Married to his wife Mary around 1909, he was working as a waiter in a cafe at the time of the 1920 Census. At that time Antonio and Mary Panetta were living at 1200 Van Hook Street in Camden's Whitman Park section with their six children. More children would follow in the 1920s. By 1947 Antonio Panetta had passed away. The bar was then being run by his widow, Mary Panetta. 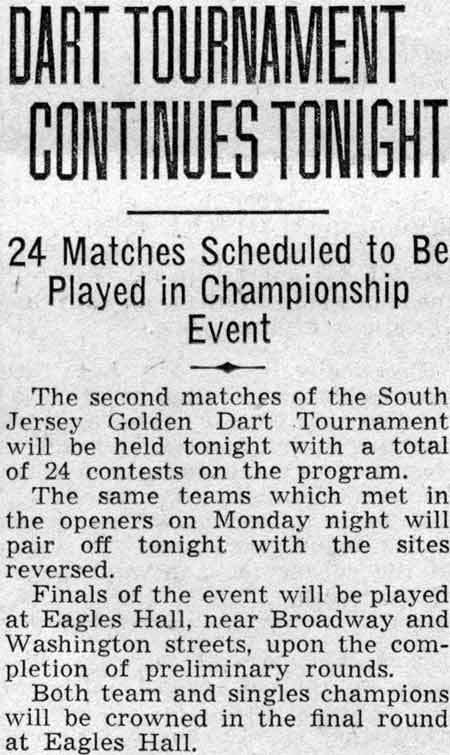 A son, Leonard worked at the bar, and son, Antonio Jr., who lived in the Delair section of Pennsauken NJ, also worked tended the bar, as did a third son Gus. By 1954 the family had incorporated as Len Ton Inc. The 5-7-9 North 4th Street bar was renamed as the Center Tavern. 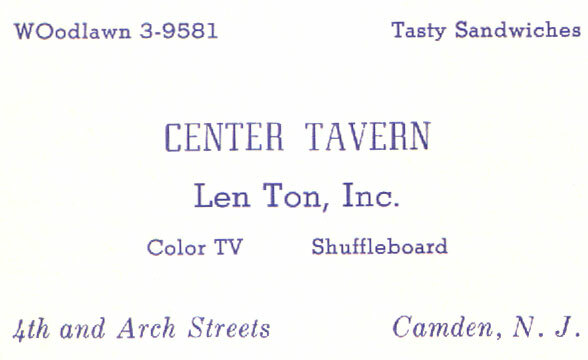 The Center Tavern remained open on North 4th Street through 1966. The bar is not listed in the 1970 New Jersey Bell Telephone Directory, and the building in which it stood has been gone for many years. 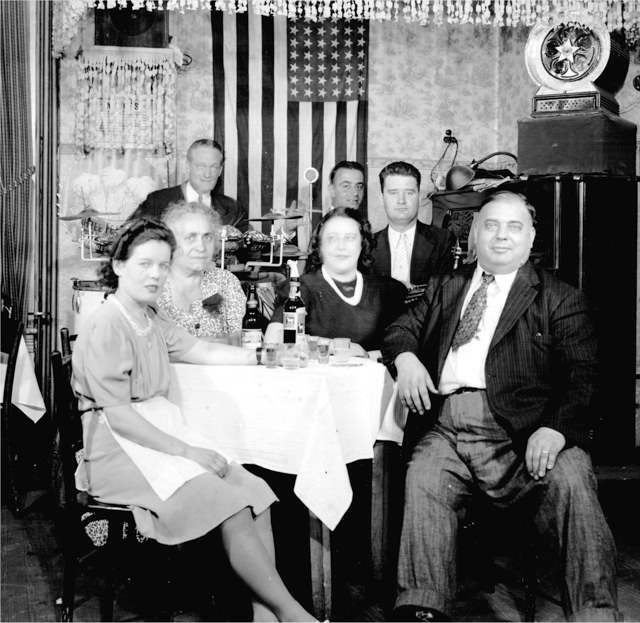 The family sold the bar to the City of Camden, and was razed as part of an urban renewal project which. Antonio Panetta, 52, proprietor of the Big Horn Grille, Fourth and Arch streets, was arrested yesterday on a warrant by Patrolman John V. Wilkie. Panetta was charged with violating the city ordinance forbidding the sale of alcoholic beverages to minors. Wilkie said the warrant was based on statements obtained from several persons less than 21 years of age. 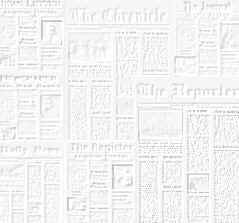 alcoholic beverages to minors, Antonio Panetta, 52, proprietor of a cafe at Fourth and Arch streetss, was found not guilty by Police Judge Mariano yesterday. on a statement made to him by Nora Williams, 18, of 625 North Front street. not have been served without him knowing it. He said whenever he thinks a customer is under age, he gets the suspected person to sign a card. He said he was in his establishment on both nights when the girl alleged she got beer, but had not seen her there. Mrs. Panetta corroborated her husband's testimony and the waitress denied serving the girl. happened on those days, why the warrant was not issued until yesterday." Thanks to Dianne Weyant for her help in creating this page.